When I’m not power walking across Waterloo Bridge, toast in hand, I love to make a bit of an effort with my breakfast. Often, the kind of morning where I have time to make something nice breakfast turns into a sort of brunch, but by the time I’ve managed to drag myself out of bed this is definitely worth getting up for! I’ve added pumpkin seeds top of my toast here, however if you’re not a seed kind of person you could leave these out or replace them with fresh herbs or even natural yoghurt. Pre heat the oven to 200C then, using a chopping board and small knife, chop the tomatoes in half and place on a baking tray along with the sweetcorn, olive oil, salt and pepper. Muddle the tomatoes and sweetcorn into the oil and seasoning with your hands, then put the tray in the oven for around 10-15 minutes. While your tomatoes are cooking, prepare the avocado by cutting it in half (around the stone, lengthways) and scooping out the flesh with a spoon. Put this into a small bowl and, using a fork, mash to your liking. Then, add the juice of half a lime (I’ve used a lime as that was what I had in the fridge this morning, however feel free to use a lemon or no citrus at all if you prefer), salt and pepper. Once you’ve prepared your avocado, put a frying pan on a high heat on the hob with a small scoop of butter. Once the butter is bubbling and hot, crack in your egg and fry until the whites are solid. I like to flip mine over but your egg preference is entirely up to you! Whilst your egg is cooking, pop your bread into the toaster and butter it once it is done, then take the tomatoes and corn out of the oven. 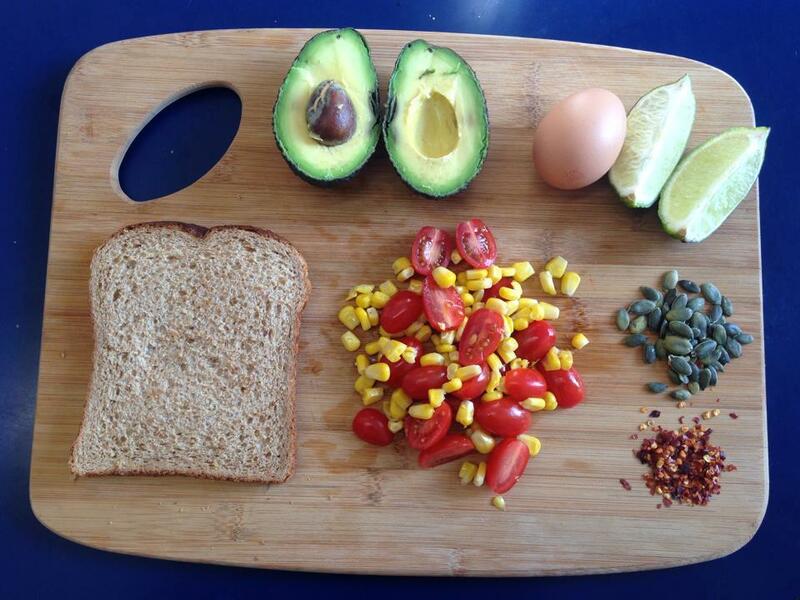 To assemble, spread the mashed avocado on your toast, top with an egg and your roasted corn and tomatoes. 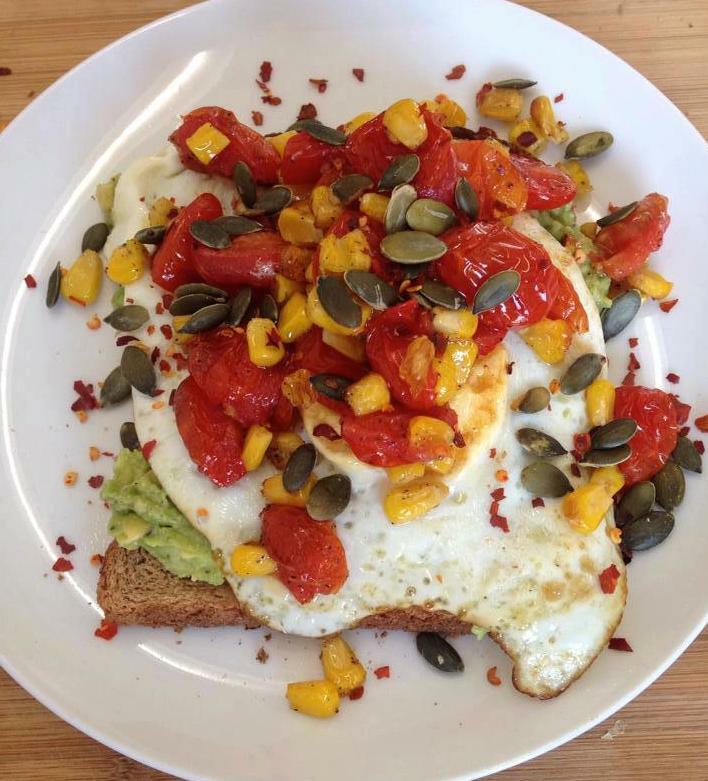 Finish your breakfast off with a pinch of salt, pepper and chili flakes, followed by a handful of pumpkin seeds, and there you have your lazy morning breakfast! Great post! As a non-seedy person I am looking forward to making this!